A highly insulated window will prevent heat loss from the house and isolate cold air away from the building as well during cold winters. Nowadays there are wide range of choices regarding windows and window frames. A right choice, not only keeping the heat in the house efficiently, but also saving energy and subsequently your money. Most of the modern windows are double-glazed. They are made with two large panes of glass where air is trapped in between. In this way, those windows are sealed and the air trapped acts as the insulation from the outside temperature. In order to increase the ability of insulation, inert gas such as argon or krypton is filled between the glasses instead of normal air. Those gas-filled windows reduce heat transfer and obtain a better thermal resistance. Sometimes different heat-absorbing tints will be applied to the surface of windows to absorb different amounts of sunlight or keep out light. Different colours absorb different levels of light. A light coloured window is better for winter, as it allows more sunlight to enter the room. And a darker one which avoids sunlight from entering is more suitable for summer. Low thermal emissivity coated windows are also efficient to prevent heat loss in cold weather and heat gain in hot weather. 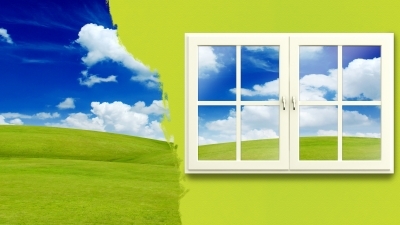 Together with double-glazed windows, they provide an optimal energy-saving strategy for your household. But for an even better result, one should choose window frames with better insulation as well. Aluminium or other metal frames are usually used in large constructions. They are durable and comparatively cheaper, but they have a bad thermal resistance. That means they provide poor insulation effect. But when a plastic thermal break is applied, their insulation ability will be highly increased. Wood frames are very good at heat insulation, but they are more expensive and need a lot of maintenance. They are easily affected by weather. They shrink when it is dry and swell when it is humid. Frames with composite materials perform better than wood. Composites combine two or more constituent materials to obtain aesthetics, which make them more resistant to humidity changes. Fiberglass frames are very good in insulation compared to wood. They are durable and don't need a lot of maintenance work. The big disadvantage is that, their cost is comparatively high. Vinyl or PVC frames provide very good insulating function. They are durable, require less maintenance work and most importantly, they are cheaper as compared to fiberglass frames. But from environmentalists' point of views, they are not so good as they contain very low recycled content. Besides choosing the type of windows and window frames, you can also consider other means to reduce heat loss or to keep out sunlight, for example, using blinds or curtains. If you are living in an area with drastic temperature change in a year, the money invested in installing windows and window frames would be a bit high at the very beginning. But compared to the money you save which reflects at your energy bills, it is still worthwhile in the long run. You Choose Windows are a trusted and truly independent window brokers supplying and fitting a wide range of steel windows.